Everyone knows Chase – he is my trademark, the handsome face of my trekking centre, my lead horse and my dream boy! In fact, he is so important to me that his measurements have been taken for a carved sculpture that will eventually stand outside our lodge. Little did I know all those years ago when I first saw him that Chase would go on to be the horse of a lifetime. I was pregnant with Georgia when I bought a little coloured cob called Cheyenne from a friend. Because I was pregnant I didn’t try him and took somebody else with me to ride him. As time went on I was concerned that he might have a little niggle and after I was finally able to ride him myself I confirmed there was minor lameness and I knew he would not be suitable for the centre. My friends were happy to have him back and they had two others as potential replacements. 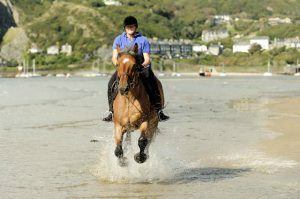 I went to look and found a three-year-old Irish Sport x Connemara – called Winston! As soon as I saw him I liked him, but he was destined for the trekking centre, not for me. He was only lightly backed and the lady who had broken him in found him to be very bouncy and lively, I had a sit on him in their arena and then asked if I could hack him out. I expected a nice route in some open countryside – but they took me along a main road with lorries flying past! He never batted an eye though, so I ended up bringing him home. He needed some schooling and final touches because he was a little sharp, so I started riding him, because my lead horse Echo was off work at the time. We bonded really quickly and the more I rode him the better he became and I started teaching him tricks. Echo never really returned to full work, so Winston became mine – and had his name changed to Chase, which, I think you will all agree, suits him so much better. We have never looked back and we have a fabulous relationship. I have always loved black horses and Chase is my own Black Beauty. He is by nature independent, he never bullies other horses or people, nor is he bullied. He knows exactly who he is – his own man. He is laid back but ready to fly at any discipline at a moments notice, whether it be traditional riding, western or no tack. I do not think I will ever have another like him. He is completely attuned to me. He loves me and I love him, he isn’t an openly affectionate horse so I have to steal kisses, but he loves me if I have food! 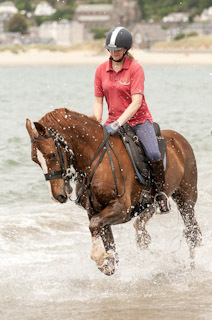 Chase is the ultimate guide horse, he knows his job 100 per cent. 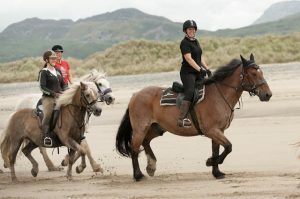 He leads the Sheriff’s Ride; he swims in the sea on the Wales holidays; he is trained for mounted archery. He can do anything and the latest string to his bow is to be my ‘horse ambulance’ since I qualified as a first responder. He is the image of the trekking centre – the one and only Chase. On we go with our insight into our lovely horses and we’ve reached C, so I will start with a boy who has a special place in my heart. This handsome chestnut Welsh Section D came from my favourite stud – Yswain Cobs – and his registered name is Yswain Capulate. 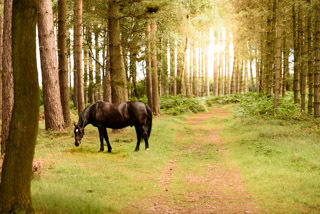 I had bought two of my original trekking horses from there, Emrys – who is still going strong – and Bugsy. I went to have a look and found the most showy, stunning chestnut colt. I decided to try to keep him as an entire as I had always wanted to breed my own horses. He had the most fantastic paces and movement but he was a very sensitive horse and I quickly discovered he was quite quirky. As time went on Capulate became more of a handful as a stallion. He spent a lot of time standing on his back legs! I mated him with my mare Sophie and that match produced the fabulous Atlantis. 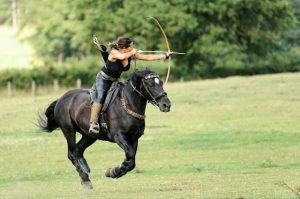 But as I started to break Capulate in I found I was facing quite a challenge, and in fact he is one of the hardest horses I have ever had to train. Not only was he very sensitive, but the fact he was still a stallion complicated matters and I really had to use all my knowledge and think out of the box to get through to him. I spent six months without even hacking him out. And then I finally decided to have him gelded because it got to the point when I wasn’t happy to have my staff handling him. I would have loved to have kept him as a stallion because he is so well bred, but other people found him too difficult to manage. My business head said sell him because it was going to be such a long road, but my heart said keep him because if he fell into the wrong hands he could be dangerous. And now I am so glad I kept him, persevered and kept on working with him. I like to think that Capulate is my greatest achievement. He has turned out to be the most fabulous, fun and beautiful little horse. He is so impressive to watch and is a fantastic ride. 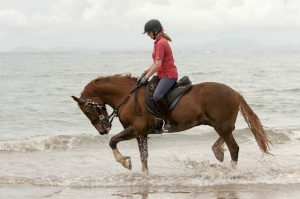 He is enthusiastic in his work, leaps into his canters, and is always happy and contented. I never thought I would see Capulate develop to where he is today. 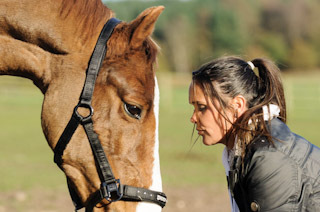 He is one of the horses that has helped me the most in developing my training skills. Buttons is a very handsome standard bred x Irish tri-coloured lad who is a huge favourite here at the Trekking Centre. His formal name is Billy Buttons, but we’ve never used the first part as when I bought him I already had a Billy, so he has always been just Buttons. He arrived as the result of a phone call. Someone rang me and asked if I was looking for a new horse. He was only four, still a stallion and had been used for driving in a trap. But I was told he was flashy looking and just my type so I headed over to Hednesford to have a look. He was a little bit feisty natured and I could see he had a few behavioural issues, but I agreed to buy him. I didn’t bring him straight home though. First stop was at my vet’s, where I dropped him off to have him gelded. I had it done at the clinic because it can be a more serious operation for an older horse. When I brought Buttons home I had to break him to ride, so began long reining and loose schooling. I think because he had done a lot of driving he didn’t much take to schooling so I just got on him and rode him out. He has never looked back and has gone on to become a great lead horse for us. His first 12 months in the field were a bit of a battle for him. Because of his character and the fact that he was gelded late he wanted to be in charge of the herd and it took him a while to achieve that. But now he is the boss and he watches over them all. Buttons is a fantastic all-rounder. 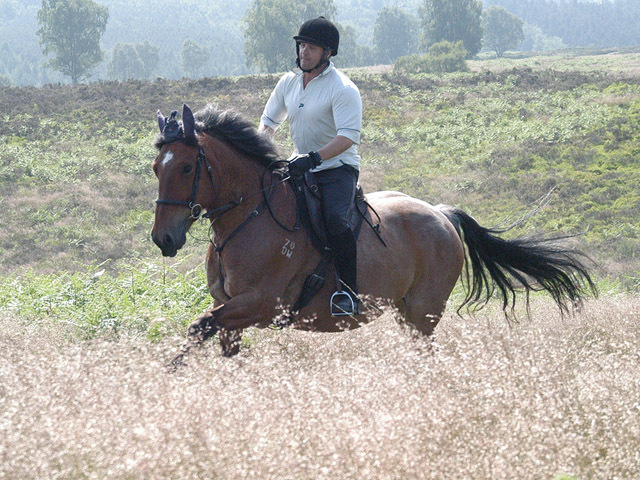 He is a firm favourite and very popular with our experienced riders. B stands for Big, Bold, Brave and Beautiful – and Brodie! Our gentle giant is draught x Ardennes, and it is from the Ardennes side of his breeding that he gets his distinctive strawberry roan colouring. I first spotted Brodie as a three-year-old. Before I bought the land here we used to ride past the field where he lived and I absolutely loved him. Then I used to see the lady that owned Brodie riding him out on the Chase and I thought what a confident and enthusiastic young horse he was. One of my regular riders used to take him out once a week and I was always amazed by how forward going and strong he was. So I asked his owner for the first option to buy if she ever had to part with him. And I was delighted when I received a phone call from her. She felt he had grown too big for her. I didn’t hesitate.I went straight over, and even I was shocked at how big he had become. But I took him straight home and he immediately went into the Trekking Centre. Brodie was completely unfazed by the whole experience and only a couple of months later he went on his first Sheriff’s Ride. He was fantastic and really enjoyed himself. For such a big horse he has always been agile and light on his feet – you can even get him to piaffe! Brodie is a real gentleman and he loves his cuddles. He has been at the Trekking Centre for many years now and he has never changed. If you drop your reins and relax he will go along quietly. If you pick them up and ride him he is still as powerful as he always was. Hopefully we will have many more years of enjoying him.